I've really been enjoying reading Simone Madigan's blog States of Nature. Simone runs a print-making studio specialising in handcrafted prints on cotton, linen and hemp blends, also under the label States of Nature. Designed and created in Australia, States of Nature textiles are printed using water-based inks and sustainable practices. You'll find a range of clothing, accessories and homeware including scarves, t-shirts, satchels, and a killer collection of wooden brooches using certified plantation timber grown in NSW that have been noticed by the editors of all the cool mags. 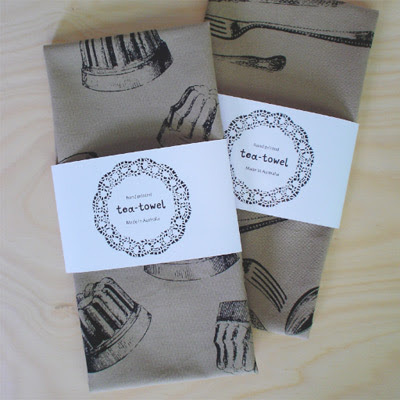 I'm particularly with the fun textile designs, including the new jelly mould and cutlery designs (on tea towels), the woodcut and zipper designs and of course the peacock feathers which will never go out of style. 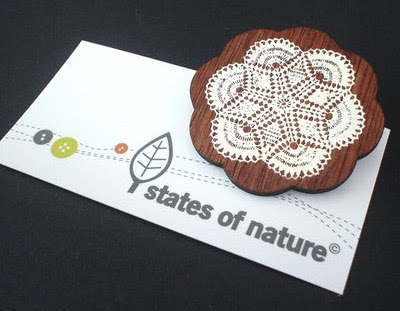 You can find States of Nature brooches, scarves and t-shirts in the online store as well as stockists around Australia (email Simone for a list). States of Nature will also be previewing product at the upcoming Finders Keepers market in Brisbane October 31st - November 1st, 2009. Find out more on the States of Nature website/blog.